It took about 45 minutes to make, but "Feel It Still" has become the No. 1 alternative rock song of 2017, and one of the year's biggest crossover hits. The band with the unique name — Portugal. The Man — recorded it, and they live right here in the Rose City. Their name comes from the melding of an entity (a country) and a human at the same time, with some David Bowie "bigger than life" flair added. Portugal. The Man has been riding the wave and loving it, from an appearance at the American Music Awards to an international tour to a Grammy Awards nomination, and every late-night show between, basking in the success of "Feel It Still" from its eighth studio album and sixth with Atlantic Records, "Woodstock." 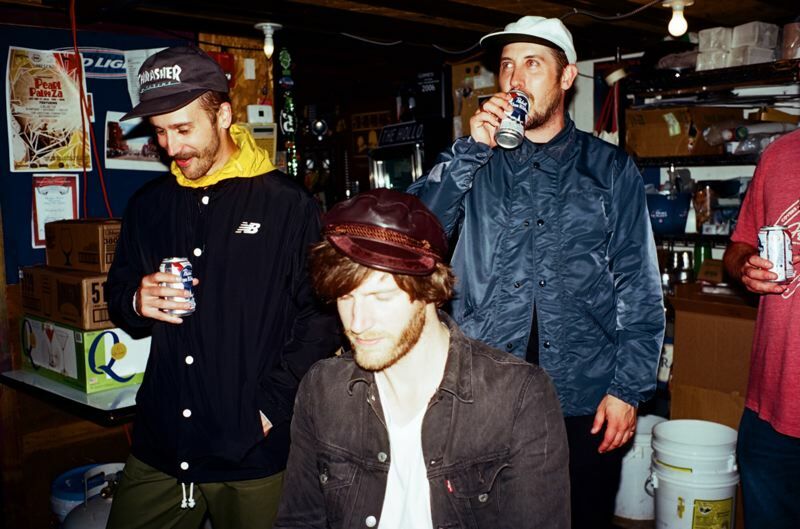 Original members John Gourley, lead singer and guitarist, and bass player Zachary Carothers are from Wasilla, Alaska, and remain best friends despite being opposites. Gourley is an intense introvert, Carothers is a laid-back extrovert. They and three other band members — keyboard player Kyle O'Quin, guitarist Eric Howk and drummer Jason Sechrist — have called Portland home for many years. "It's pretty crazy," Carothers says. "I knew we wrote a really good song; we figured it would do well on alternative charts. It's not blind luck. We knew we had something great, but we did not know it would cross over and became what it has. Nobody plans for that." Tribune: Other than a smash No. 1 hit, what's going on lately? Carothers: We've been in Europe two or three times this year. We are actually (back in Portland). I can't tell you how good that feels. It's the best city in the world, and we've been gone from it for quite a long time — no sleep, lot of work. I'm going back home to Alaska to see my mom, and I plan on sleeping a lot, hanging around in sleep pants, gather rest and information. ... We've been traveling so much lately, (John) wants to stay put and hang out in Portland. Tribune: So, you're enjoying life in the Lower 48. Carothers: I know, right, I still love that — I tell people all the time we call it the Lower 48. I go back two or three times a year (to Alaska), as much as I can, we don't have a lot of time off. I really miss it. Portland is amazing, but I still miss home. People ask if I'd like to live up there, but it's too long of a flight. But hopefully I'll die there. Tribune: Rockers from Alaska — you're still proud of that fact. Carothers: Never forgetting where you're from but never settling and always wanting to be someplace new. Leaving Alaska was such a big inspiration for us. It would have been easy for us to stay there, we both had jobs, we could have stayed and made money, we were content and happy. The thing about Alaska is there's not a lot of outside influence. We got a little bit from Russia, and we love the Native Alaskan aspect. ... We come to Portland, and we see different restaurants and people and art, you're going to movies and shows, there are cool photographers, parties and warehouses, it made me hungry to see the rest of the world. Alaska is an amazing place, but very isolated. Tribune: Can you see Russia from your hometown? (Referencing politician Sarah Palin's infamous quote about Wasilla and relations with Russia). ... Wasilla is now known for something else other than the Palins. Carothers: Actually, (Palin) doesn't like me very much. I was active in the community, a punk rocker who argued with her for a few years to get a skate park built back when she was our mayor. If we raised a certain amount of money, the city would match, and we'd get a skate park. We ended up raising the money fast, and she turned back and said it was no longer in the budget. I'm 16, we had raised $50,000-60,000 of the community's money, and we don't know what to do with it. I argued with her again, brought all my (loud) friends, guys with missing teeth and mohawks. It finally got built. It's one of the most proudest things I've done. Tribune: And, then Palin went national as the vice presidential candidate. Carothers: I was in San Diego and woke up to a text message from Eric (Howk), about 60 text messages from people, and I thought, "Is this real?" But, it worked out for the band as well. We were putting out a record that week ("Censored Colors") and suddenly everybody cared because they googled Wasilla. We started getting calls from The New York Times and crazy newspapers. Hilarious press for us. They just wanted to talk about Sarah Palin. Tribune: Now you're an alternative band sitting on top of a different world with "Feel It Still." Carothers: People wanted something new. I guess it was us. It's weird being thrown into that world; the pop world is so fun and different. It's opened up so many doors. We played the American Music Awards a few weeks ago. It was insane; we partied it up, walking the red carpet. I wore a shirt with buttons, a nice shirt, brand-new. We get to be a rock 'n' roll band, and we're up against Tayor Swift for chart placements. I'm 36, we're from Wasilla, Alaska, and I don't have a six-pack, and I have vitamin D deficiency. Tribune: Portugal. The Man is up for a Grammy (Best Pop Duo/Group Performance). That's pretty mainstream, huh? Carothers: I love that. That's a lot of problems with friends' bands. They want to keep things small and cool. I want to go mainstream. I've never understood that argument. People hear you on a commercial and get bummed about it. What do you want to hear? You'd rather hear bad music? I want to hear good music bouncing off everything, echoing everywhere. It can be danceable and have art and a message. A lot of people mistake pop for bubble gum; taste good but loses flavor quickly. David Bowie, who's inspirational to everybody, they never questioned him. Let's get better music on the radio, and on TV and in movies and shows, at the Trail Blazers game. I don't see the argument fighing against that. Tribune: Tell me about your Grammy plans. Carothers: Mom is getting all excited. My family is fighting over tickets. It's normally at the Staples Center (in Los Angeles). This year it's at Madison Square Garden (in New York), significantly smaller. I'll break a pool cue in half and let them fight about (tickets). I'll bring my girl and my mom, then I got one more — maybe it'll be dad or my brother or stepdad. Tribune: The band started in 2004, but you and John have known each other forever — no disharmony? Carothers: That is the biggest accomplishment we've ever done. It's hard; you go through ups and downs, you're completely different people, it's why it works, yin and yang. Everybody really balances out the force. We're six completely different psychopaths (in the band). Tribune: It's actually a volatile relationship? We've broken each other's ribs (in fights). This is our everything — career, passion, hobby, love of everything rolled up into one. But you can't equate it to a marriage; in marriage two different people go to work separately. For us, it's 300 days a year, it's all day every day. We care a lot. Tribune: What's the story behind "Feel It Still"? Carothers: It was mostly John; he was rolling. Normally we'd come up with a line, talk about it. I'd say, "That's pretty good, I can't beat that." Normally it's back and forth. It was the easiest and fastest song we've ever written. We were in John Hill's studio in Venice, California, and we were actually working on "Live in the Moment," mixing that, changing things. John went into the lounge, and he started playing that bass line. (Friend Asa Taccone) started hitting the table for a beat. ... We'd come up with a line, sing it, record it. That song literally came together in 45 minutes to an hour. It was ridiculous. We had that lyric, "I'm a rebel just for kicks," and used it in different songs, but we never had the right melody. We sang it to the Oasis ("Champagne Supernova") melody and "Please Mr. Postman." We often do it as a placeholder when we can't think of something. We threw it down and kept on going. Our intent was to change it. We listened to it, and said we can't hear anything else. We thought it was pretty cool. Tribune: Indeed, you use interpolations from The Marvelettes' "Please Mr. Postman." Carothers: I've never been shy about where we gain influence from. ... We knew that we would be giving away 50 percent (for licensing); it's money we're not going to make, but it's very important. It's rad to give guys who inspired us to make music, to give to their estate. We did that with Richie Havens on the first song on the album. ... Maybe it'll inspire some kid who hears it to like Motown. I really like that circle of life. Tribune: At some point you want to move on from "Feel It Still," right? Carothers: "Live in the Moment" just dropped on alternative (radio/downloads). "Feel It Still" still has legs; do we push other songs? We didn't have a game plan for this. It's been a wild ride, we haven't really stopped. We won't truly realize what happened until 10 years from now. ... We just recently got the longest running alternative No. 1 hit. That's crazy, insane. "Boulevard of Broken Dreams" (by Green Day), you're telling me that this song is No. 1 longer than that? Longer than Muse ("Madness," which held the previous record, 19 weeks) and Foo Fighters? We don't really know what it means and haven't stopped to figure it out. ... We travel, drink too much and play a show. We haven't stopped. Our lives haven't really changed. We still drive around in the same terrible tour van from 2008. Tribune: How's Portland treating you? Carothers: We lived in Southeast forever. My girlfriend lives in Southeast. My place is in Northeast, the Alberta Arts District. John has a house out in Mt. Scott. ... We definitely got our stomping grounds. The food in this city is insane. Generally, except for last night, I tend to be a better boy when I'm home, because I do so much damage on tour. I try to eat lentils and drink smoothies. I go to wine. Come home, no whiskey or beer. I'm 36, I gotta take care of things a little more. My body is a machine, and it's fueled by that terrible stuff. In the middle of a tour, I'll order a kale salad, and my body will just get sick. You need chicken wings and beer.